Abstract: Symba is an Enterprise SaaS cloud-based platform helping companies manage the internship experience. Founded by an all-female team in the USA, Symba is creating valuable experiences, one internship at a time. In this talk she will tell us about her startup Symba, what's like to be a startup founder in America, and how she got started. 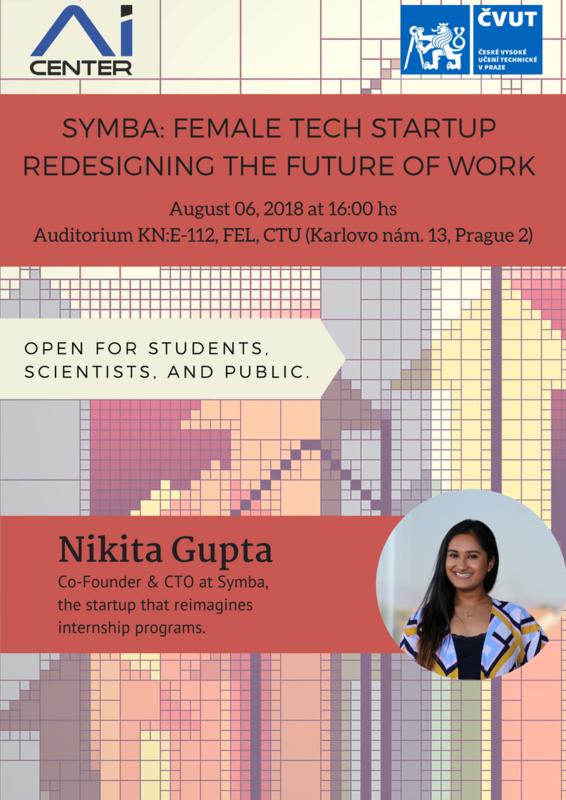 Nikita Bio: Nikita Gupta is the Co-Founder and Chief Technology Officer of Symba, and is a graduate from Cornell University with a degree in Computer Science and Engineering. Nikita has previously worked as a software engineer with a growing startup in Washington, D.C., as well as with Apple Inc. in California and Bank of America Merrill Lynch. Nikita was the Vice President and active member of Women in Computing at Cornell, and an instructor for Girls Who Code. Nikita has been committed to improving the climate for women and has received the Alice H. Cook & Constance E. Cook Award for encouraging female students with opportunities in the tech industry. She is passionate about promoting women in tech and for launching careers in engineering. In her spare time, Nikita loves to cook, scuba dive, and dance. Nikita can speak three languages, including Hindi and Chinese.